Limit time outdoors in cold temperatures to just a few minutes. If it's too cold for you to stay outside, it's too cold for your pet. Consider protective colthing, including head coverings and footwear for puppies, short-haired or senior dogs. Keep food and water bowls where they can't freeze. Provide extra food. During cold winter months, pets require more calories to regulate body temperatures. Don't clip. 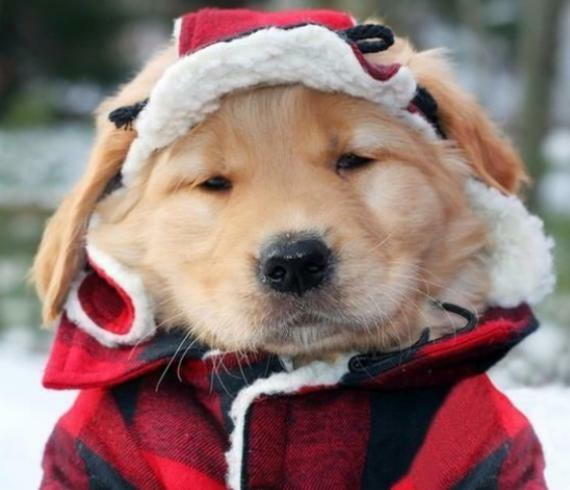 The thicker winter coat your dog grows is there to provide warmth and protection. Don't let your dog eat snow. It can cause stomach upsets or hypothermia, and may contain sharp objects or dangerous chemicals. Beware of frozen waterways. Never allow your dog to walk across these areas. Make sure outdoor kennels are well insulated. If you have a double-coated dog that is suited to cold weather, they will still need a dry, draft-free shelter with plenty of protective bedding. Overall, don't make the mistake of assuming that dogs are built to live outdoors in the cold. They depend on us to keep them warm and safe, so follow these tips this winter and your pet will thank you! If you have any questions, feel free to call us at (918) 609-6111 or visit our Contact Us page. We have a brand new app for iOS and Android devices! The app is free and provides the easiest way to schedule appointments, request medication refills, get pet owner tips, access special promotional offers, and more!